I had a captivated audience when I helped open a new footpath on Brighton Avenue at Toronto! Jokes aside, this group of residents has campaigned for decades to get proper footpaths in the area. I congratulate the Toronto Area Sustainable Neighbourhood Group and Coal Point Progress Association in particular for the work they do in their local communities, and to Lake Macquarie City Council for making a fine job of it. 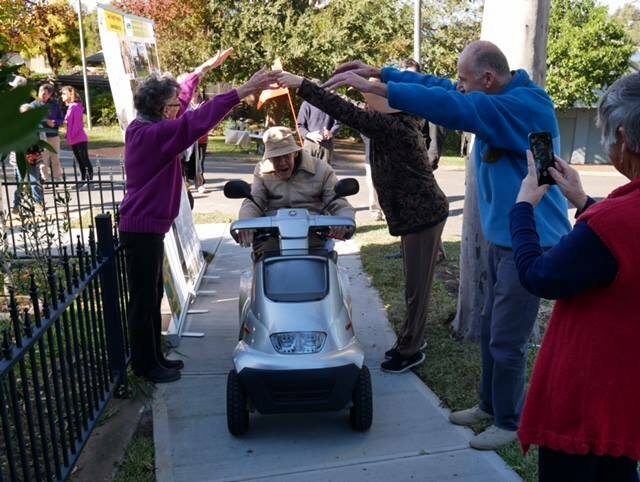 None were happier than long-time resident John Cross who finally got his motorised scooter off the road! "THE old timers in Toronto will tell you they first started campaigning for a footpath along Brighton Avenue in the 1960s. For decades, limited funding and competing priorities conspired to prevent Lake Macquarie City Council from committing to the project. But on Friday, the final stretch of that footpath into the town centre – between Jarrett and Ambrose streets – was officially opened. Residents were rapt with the council’s work, and with the state government for providing the grant that got the footpath going. Toronto Area Sustainable Neighbourhood Group (TASNG) chairman Nico Marcar said the footpath was the reward for community perseverance. TASNG and Coal Point Progress Association (CPPA) had sought funding for the footpath since 2015. They got their breakthrough when they received a grant through the state government’s Community Building Partnerships program. “Without that grant, we would never have got the footpath,” Mr Marcar said. He said Brighton Avenue was a busy street which, prior to the construction of the concrete footpath, had proved challenging for many pedestrians. “The terrain you have to traverse here is undulating which makes it harder for people with disabilities, mobility problems, or pushing strollers,” he said. Other locals had long opted to walk into town along the lake foreshore. But that also became a problem in wet weather. He said completion of the footpath would also help to keep more cars from contributing to traffic problems in Toronto. Member for Lake Macquarie, Greg Piper, said he believed projects that helped to connect communities were one of the best uses for grants through the Community Building Partnership program. He praised locals for “agitating” so compellingly for the footpath. “This community doesn’t just complain, it puts up solutions,” Mr Piper said. Lake Macquarie City Council completed the last stage of the footpath in less than two months. Council’s acting infrastructure, assets and strategy coordinator Matt Brogan said community connectivity was a high priority for the council, so the path had been “a great outcome”.